Refer a friend and you both receive a $10 credit on your accounts. Simply enter your name, email, phone number and your friend's e-mail address. Direct access to view your pets appointments, reminders and prescriptions. View/print health certificates. Pet Emergency? Call us right away at (336) 665-1286! If you live in Greensboro or the surrounding area and need a trusted veterinarian to care for your pets – look no further. Your pets’ health and well-being are very important to us, and we take every possible measure to give your animals the care they deserve. Bel-Aire Veterinary Hospital is a full-service animal hospital and welcomes both emergency treatment cases as well as pet patients in need of routine medical, surgical, and dental care. Our doctors have years of experience treating serious conditions and offering regular pet wellness care. Beyond first-rate pet care, we make our clinic comfortable, kid-friendly, and calm, so your pet can relax in the waiting room and look forward to meeting our Greensboro veterinarians. We are happy to offer a number of resources that enable you to learn about how to take better care of your pets. Please feel free to browse our site, particularly the informational articles. The best veterinary care for animals is ongoing nutrition and problem prevention, so becoming knowledgeable about preventative pet care is essential to the ongoing success of your animal’s health. If you have any questions, call (336) 665-1286 or email us and we'll promptly get back to you. 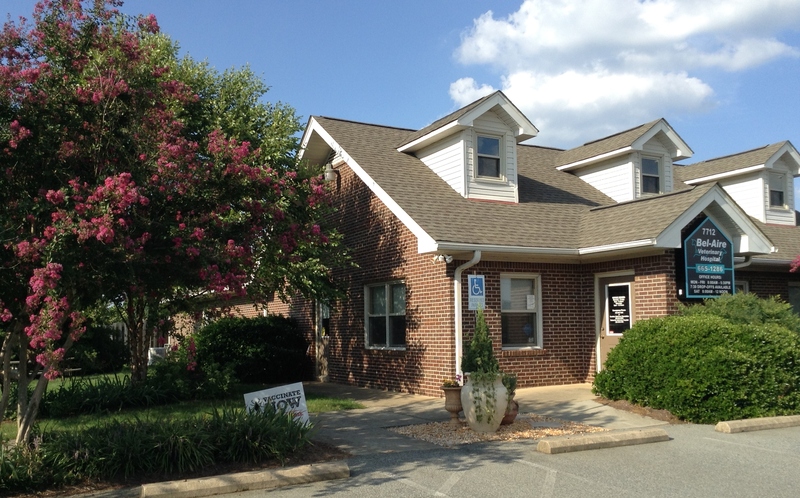 Our Greensboro veterinarian office is very easy to get to -- just check out the map below! We also welcome you to subscribe to our newsletter, which is created especially for Greensboro pet owners. At Bel-Aire Veterinary Hospital, we treat your pets like the valued family members they are. "Great staff and Dr. They treat your dog as their own. I have received nothing but excellent service from the entire staff. I would recommend Bel-Aire to anyone who needs a Vet." "We have always receive the best care for our pet. They are professionals, second to none -from front office to veterinarian assessments, procedures and surgeries. Cant ask for more! Grateful to have them in our community." "Love all the staff and Dr P. They are always willing to answer my questions and very friendly. Dr Packard and her assistant worked with our pitbull Petey until he calmed down enough to feel his kneecaps then set us on the right path to help him be more comfortable. They have been there for us through many many animals and we are very great full for their compassion and knowledge."